The submission, Ross Sinclair: 20 Years of Real Life consists of seven publications discussed in a critical overview, with three supporting Appendices. Together they document and analyse the diverse outputs of my practice-led research project, Real Life, initiated in 1994. 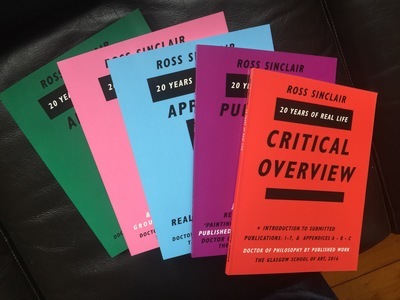 The critical overview argues for the innovative nature of the Real Life Project through its engagement with audiences and demonstrates its contribution to the field of contemporary art practice, across the disciplines of sculpture, painting, performance, installation, critical writing and music. Since the inception of my Real Life project I have explored the agency and impact of the artwork and exhibition in relation to audience exploring new methodologies and in June 2016 was awarded the Degree of Doctor of Philosophy by Published Work at GSA/GU titled, “20 Years of Real Life”. 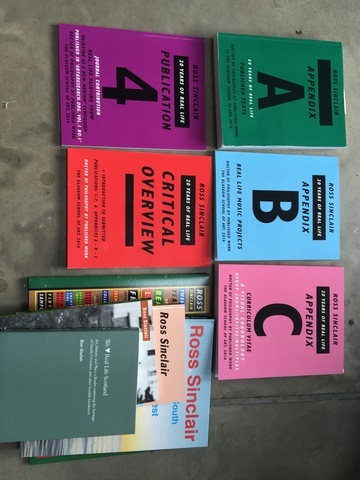 Here I set the project in critical overview around the philosophical paradigms of Barthes, Baudrillard and de Certeau viewed through a contemporary critical framework of Bourriaud, Bishop and Kester. I argue my project represents a unique and idiosyncratic contribution in its own right to these debates when viewed as a single longitudinal project, unique in recent art context. The impact, influence and contribution of this project is viewed in this submission through the prism of the 5 institutional monographic publications on my work as well as 2 contributions to refereed journals and 3 Appendices describing the project output and published writing, two of these appendices alone exceed 400 pages in length. I will continue to explore this project in the wake of the PhD undertaking further research. Images and full text made available under the CC BY-NC-ND license: https://creativecommons.org/licenses/by-nc-nd/3.0/ A print copy of this thesis is available in the GSA library.